Downtown Ocean Springs in the Middle of it All! 2 bedroom, sleeps 4, steps away from everything downtown! 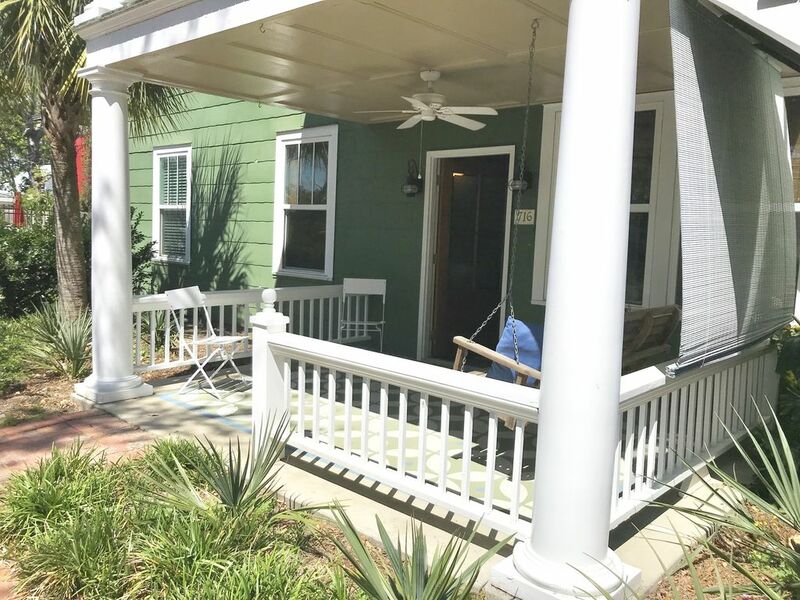 Walk off the porch into downtown and enjoy great dining, fun nightlife, eclectic shopping, art galleries, festivals, parks, beaches, museums-everything you are looking for from Ocean Springs and we are in the Middle of it All! Enjoy staying in one of the happiest, best seaside towns in the country in our fun little spot! 2 bedroom, 1 bath, full kitchen, washer/dryer, porch with swing. The best spot for festival lovers, with private parking for our guests. The Middle of it All is just that-in the middle of downtown Ocean Springs, close to eclectic shopping, casual & fine dining, art galleries, nightlife, live music, and more-all within walking distance! 2 Private spaces for our guests off the street next to the apartment. Lots of counter space and a pass through opening to the dining room. Right in the heart of downtown Ocean Springs- walking distance from great restaurants, bars and shopping. Rooster on the property have it a quaint country feel right in town. Only downside was late night music from next door. In all an enjoyable stay in a super clean and well appointed place. Thank you for letting me know. I will check into the whereabouts of the 2nd white noise machine & I have reached out to the neighboring restaurants & City officials to see about taming excessive noise. VERY CLEAN. Great porch w swing. Parking so good. Thank u for the selection of puzzles. We worked all of them. Beds are very comfortable. Would be really nice to have a dvd player especially since the cable channels are so limited. We brought our dvds with us. 2 ply tp would be wonderful. We loved the location but would be good to say its in the entertainment district so people would know its loud at night. Close to everything. Very clean, well appointed. Perfect spot in the heart of an amazingly charming Mississippi coastal town! Our stay was so pleasant. Everything we needed was provided and the decor was both pleasing and well done. We spent a lot of time walking, watching parades, and dining at great pubs just a block or so away. The porch swing was so relaxing and weekend music at night was a bonus. So charming and convenient. Definitely recommend the apartment and our visiting friends agreed!!! It was perfect! Right near our venue and downtown. I enjoyed it very much and will recommend to anyone I know! For Ocean Springs Festival lovers, this is the place to be! The Middle of it All is in the heart of downtown, close to everything-shopping, dining, nightlife, the arts, cultural events, watersports and outdoor activities, museums, just about everything Ocean Springs does so well! Come and enjoy it all at the Middle of it All!